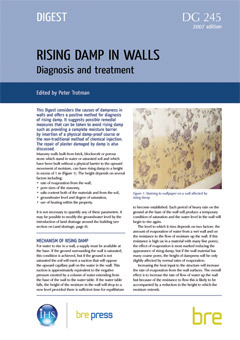 This edition has been improved by addition of guidance on types of fungal growths which, though less regularly encountered in buildings, nonetheless confuse correct identification and mislead diagnosis. It also has a short section on termites to provide reassurance on recognition and appropriate action should there be suspicion of a rare introduction. Since the first edition was published, there has been a greatly increased emphasis on conservation, repair and refurbishment of timber in buildings. There has also been an increasing desire to avoid the risk of excessive use of remedial preservatives by implementing environmental control strategies to bring decay and insect attack under control. These strategies depend critically on correct diagnosis to prevent inappropriate or unnecessary use of pesticides against extinct attack by wood borers, harmless insects or extinct fungal damage. 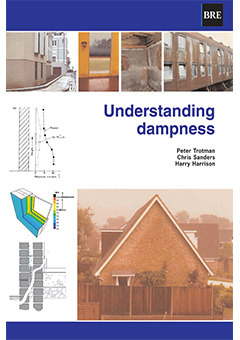 This book gives clear and authoritative guidance on the process of inspecting buildings for timber damage and on the identification of causal agencies. 132 pages. External timber structures: preservative treatment and durability. 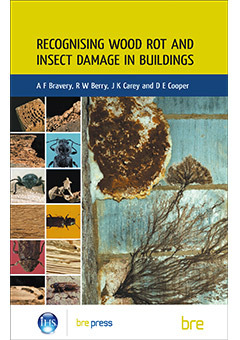 BRE Report 453, BR453, fungi, beetles, insects, dry rot, wet rot, termites, brown rot, white rot, identification, wood preservatives, pesticides, insecticides, mould, algae, wood borers, House longhorn beetle, deathwatch beetle, Ptilinus beetle, furniture beetle, Lyctus powderpost beetle, "Summer Offer"